Look what the ‘delivery man’ surprised me with this past week – my April Rubybox (YAAAY!). The girls at Rubybox really treated us this month as it included a haircare, health, skincare, fragrance and makeup product – definitely an all-rounder! I really enjoyed this month’s box, who wouldn’t love opening a box and seeing SIX surprises? As mentioned in my last Rubybox unboxing post, Rubybox is a subscription service (although you can cancel at any time) where you receive a selection of sample sized (and sometimes full-sized) beauty products – usually 4 or 5. Price is R 119 per month, which includes door-to-door delivery. For more info on this, please take a look at my ‘March 2013 Rubybox Unboxing’ post here. Not familiar with what a dry shampoo does? No shame in that, I personally only started using a dry shampoo about a year ago. In saying that, I cannot imagine how I lived a full and happy life without it! I’m sure there have been a few mornings where you wake up with flat, lifeless, oily hair (for me, that was every second morning). I used to have to wash my hair every second morning, what a waste of time!! Waste of time because I HAVE TO blow dry my hair after it has been washed, otherwise it’s a frizzy mess. And not just any ol’ blow dry session, it needs to be tamed with a round brush, a good amount on styling products and at least 45 minutes’ worth of TLC. Precious time that could be spent doing online shopping!! Then I discovered dry shampoo. Life-saver. Time-saver. Hair-saver. You just spray it on your oily roots (it’s a water-less powder formulation), let it sit for a couple of seconds, massage it into your scalp and brush through the rest of your hair. The result? Second (or third or fourth)-day hair minus the oiliness, with added volume! 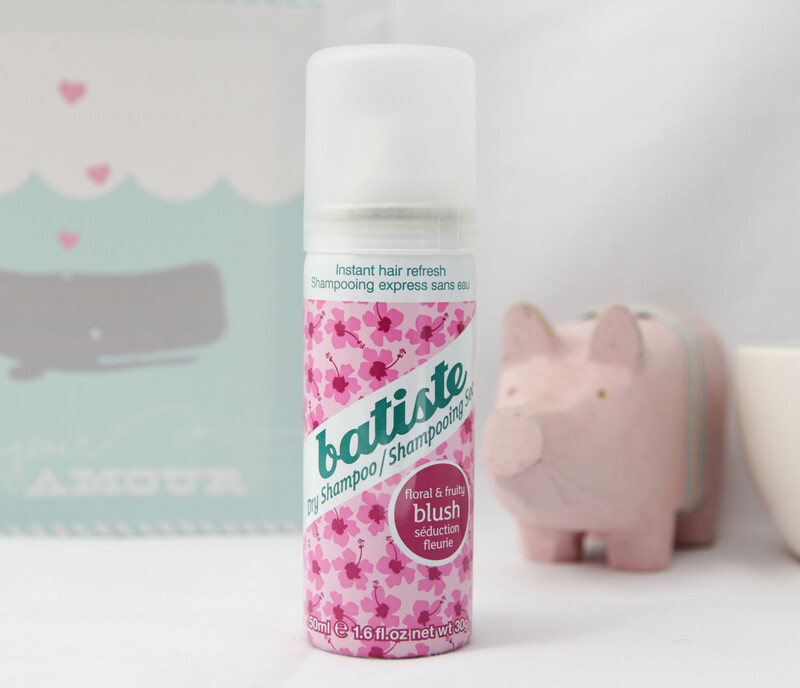 Clicks stores sell quite a variety of the Batiste dry shampoos – there’s a tropical scented one, one for blonde hair, one for brunette hair, an original one that has a very subtle fragrance, plus a few other ones. Blush has a light floral fragrance with notes of red hibiscus, orange, freesia, peony, lily & spice musk. It works like a bomb, try it! 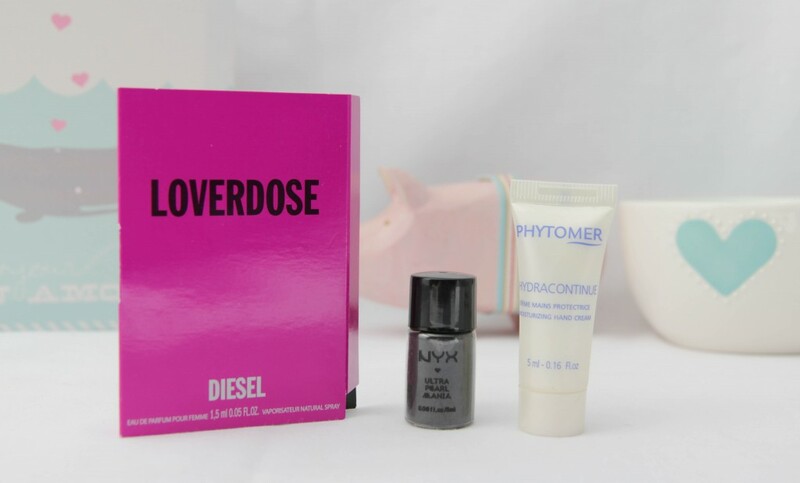 I received a Loverdose Eau De Parfum in my previous Rubybox as well, if you’re interested in reading my thoughts on it, check it out here. I love NYX products, they are affordable and the quality is pretty good. Their lip products are amazing! Now in my humble opinion Clicks doesn’t stock nearly enough NYX products, especially when it comes to their lip glosses. I currently purchase all my US brand makeup products that I am unable to buy in SA on Beauty Joint (NYX lip products taking up quite a lot of space in my online shopping basket). Anyway, let’s get back to the product I received. This little bottle has some serious shimmer & glitter going on, now it’s not really a colour I would purchase myself as I tend to lean more towards neutral colours but I can work with it. I will not be using it as your traditional eyeshadow but will probably use it to smoke out a black eyeliner. 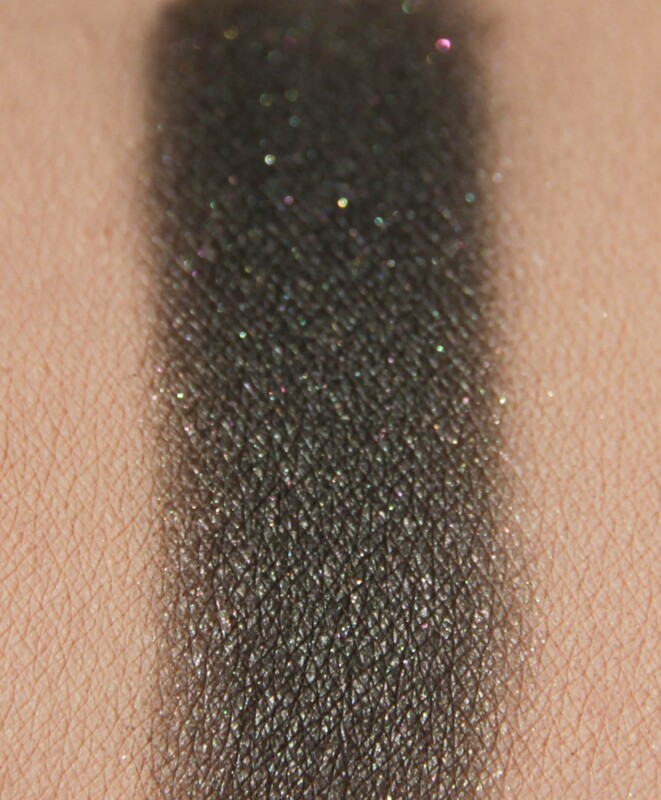 Sometimes when I don’t want my gel liner to look too harsh, I set it with a black eyeshadow and blend it out a little bit using a smudge brush. Ok, I’m giving my Phytomer Hydracontinue hand cream a bad review because there was hardly any product in my little tube. I squeezed and squeezed and squeeeeezed and a pea-sized amount came squirting out. That’s it. The scent of the product smells how my granny used to smell (which is NOT a bad thing, it brings back good memories). The cream contains sweet almond oil and shea butter, which we all know is super moisturising. I just wish there was more product in the tube. The Evening Primrose Oil vegicaps combines Omega 6, Magnesium, Vitamin B6, Vitamin E and Zinc to help women cope with PMS and menopause. Now I’m sure ladies young and old have their own personal issues with PMS / menopause symptoms. Lord knows, I need all the help I can get! The combination of these vitamins and minerals also promote healthy hair, skin and nails. The sample pack contains 5 vegicaps and these are suitable for vegetarians. The B-Cal Ultra multivitamin is packed with Calcium, Vitamin D and Magnesium to ensure bone health for women. It’s very important to start taking Calcium from an early age, Calcium is not only essential for healthy teeth and bones but research has also shown it protects against colon cancer. Who wants to deal with Osteoporosis one day? Not me! Top tip: Drink orange juice when taking your Calcium tablets, it assists in absorbing Calcium and also increasing bone mass. The sample pack contains 5 bi-layer tablets and these are suitable for vegetarians. 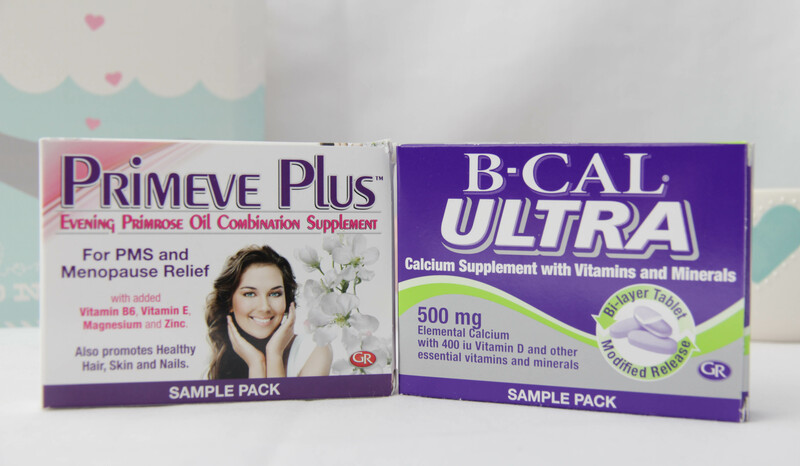 Also included in the box were 2 discount coupons – 1 x R 10.00 off the purchase price of a Primeve Plus 30’s pack and 1 x R 10.00 off the purchase price of a B-Cal Ultra 30’s pack. Wow, great value from Rubybox! I’m definitely going to try the Dry Shampoo!